Mike is one of those remarkable singers who can create an immediate and loyal following everywhere he goes. 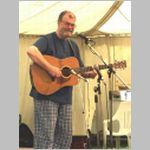 His rich voice and warm personality shine through his repertoire of traditional and carefully chosen contemporary songs. You’ll get lots of opportunity to join in.